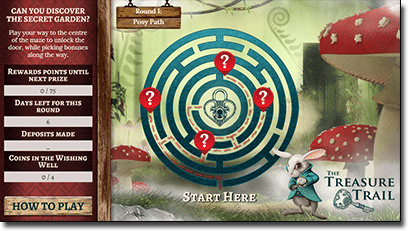 This April, Royal Vegas Casino is opening the gates to a mystical maze where playing real money games will help navigate you through to the door of a secret garden where you can unlock free spins, boosted loyalty points and matched deposit bonuses. This awesome promo is available to both desktop and mobile players, in both instant-play mode and via RVC’s downloadable casino software. 1. 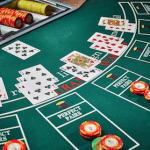 Sign into your account at Royal Vegas Casino, or follow our links to register for a new account and make a deposit to take advantage of up to $1200 in matched deposit bonuses spread out over your first four deposits. 2. Find the Treasure Trail promo banner at the top of the game lobby and click ‘Take Me There’ to opt-in. 3. Make at least one real money deposit during each round of the Treasure Trail promo period – you can see how many days are left in each round by viewing the Treasure Trail maze. 4. 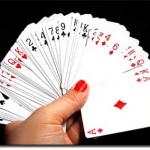 Start playing blackjack or any other casino game for real money in order to earn RVC reward points. As you earn points, you’ll make your way through the maze while claiming prizes like free spins, double reward points and match bonuses. 5. For every 100 reward points you accumulate, a coin will be added to your Wishing Well. Fill the well with four coins and it’ll burst open to shower you with a mystery bonus prize. 6. Complete your way through the maze to unlock the secret garden and you’ll be given a choice of bonuses prizes to pick from. Although blackjack might get you there the slowest, all reward points can eventually be cashed in for real money (provided you’ve earned over 5000 points) so it’s definitely worth your while to take advantage of this opportunity. Whichever game you choose to play, sign up at Royal Vegas Casino today and make the most of the Treasure Trail promotion while it lasts. If treasure hunts are really your cup of tea, head over to LeoVegas.com during April where you can also join the Leo Vegas Treasure Hunt to earn a share of $10K in prizes by playing selected pokies.